He answered this by posing 12 Questions that your business needs to answer to achieve greatness. We shared the 12 questions in 12 QUESTIONS to Take You From Good To Great - #1 & 2 covering the first two questions in more detail with comments from Collins as well as insights from working with our Gazelles Customers. 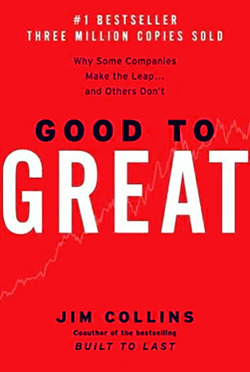 As a quick review Collins was asked what is a great organization—what are the criteria of greatness? He suggested there are three tests: Superior Results, Distinctive Impact, and Lasting Endurance. In business, performance is defined by financial results—return on invested capital—and achievement of corporate purpose. In the social sectors, performance is defined by results and efficiency in delivering on the social mission. But whether business or social, you must achieve top-flight results. To use an analogy, if you are a sports team, you must win championships; if you don’t find a way to win at your chosen game, you cannot be considered truly great. 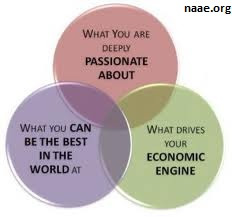 A truly great enterprise makes such a unique contribution to the communities it touches, and does its work with such unadulterated excellence that, if it were to disappear, it would leave a gaping hole that could not be easily filled by any other institution on the planet. If your organization went away, who would miss it, and why? This does not require being big; think of a small but fabulous local restaurant that would be terribly missed if it disappeared. Big does not equal great, and great does not equal big. A truly great organization prospers over a long period of time, beyond any great idea, market opportunity, technology cycle, or well-funded program. When clobbered by setbacks, it finds a way to bounce back stronger than before. A great enterprise transcends dependence on any single extraordinary leader; if your organization cannot be great without you, then it is not yet a truly great organization. Finally, Collins cautions against ever believing that your organization has achieved an end-state of greatness. To be built to last means embracing the idea that good to great is never done. No matter how far we have gone, or how much we have achieved, we are merely good relative to what we can do next. Greatness is an inherently dynamic process, not an end point. The moment you think of yourself as great, your slide toward mediocrity will have already begun. Let’s continue exploring the 12 questions starting were we left off, at number three. 3. 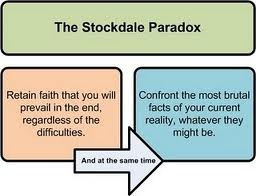 What are the Brutal Facts, and how can we better live the Stockdale Paradox? Stockdale Paradox is, “Retain faith that you will prevail in the end, regardless of the difficulties, AND at the same time, confront the most brutal facts of your current reality, whatever they might be” Admiral Jim Stockdale in Good to Great. I’ve lived the Stockdale Paradox myself, through my near fatal diagnosis with Acute Myeloid Leukemia and even after that with family. I personally know what it means to confront the brutal facts. By so as Collins states, “It will energize people.” When you know what you’re fighting, the long odds you may have, you are able to be accountable, stand up to it. Contrast this to not being aware of what your circumstances are. If things get worse you aren’t prepared for it. Give your team the worst. Don’t be afraid they will not accept responsibility. People live up to your expectations. The question you might ask if you are afraid of the brutal facts and what that might do to your team, what’s wrong with your expectations? 4. What do we understand so far about our Hedgehog Concept—what we are fanatically passionate about, what we can (and cannot) be the best at, and what drives our economic or resource engine? “If you are truly great, if your organization went away it would leave an unfillable hole that cannot be filled by any other organization,” Collins says. For example would that be the case with Southwest Airlines? I believe a lot of people would answer yes. Does your business know your Hedgehog Concept The three elements of the Hedgehog Concepts are elements of the One Page Strategic Plan: Core Purpose, Brand Promise, and Profit per X. As Gazelles Coaches we have Growth Tools to help your business discover what each of these are. Each of these strategic components takes time to explore and identify. When achieved they provide that “unfillable hole” that Collins talks about. 5. How can we accelerate clicks on the Flywheel by committing to a 20 Mile March? Is your business dedicated to the discipline of consistency and growth on a daily basis? Companies that Collins studied with a 20 Mile March philosophy came out of any industry turbulence 100% of the time (29 out of 29 times). Companies without the 20 Mile March produced just 3 times in 23 or 13%. Is it time you discovered what your 20 Mile March should be? As you can observe, the questions Collins is asking require discipline to follow through. Gazelles Growth tools and Positioning Systems commitment to Strategic Discipline fast track your organization on the journey from good to great. Ready for your flight instructions? We’ll continue Jim Collins 12 questions in our next blog.